Our cats are our children. We don't have any human kids, so our fur babies are our kids. 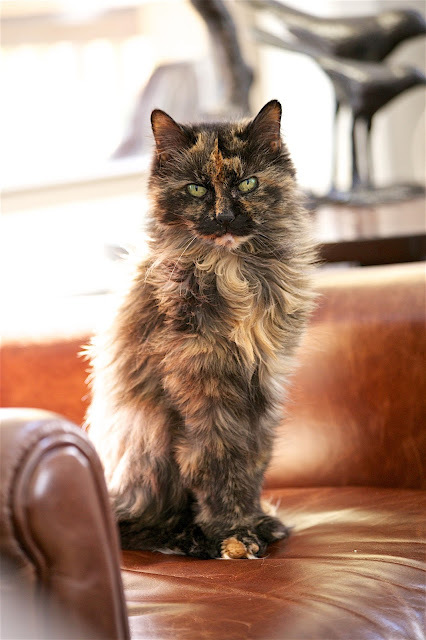 Each cat has their own special story of how they have touched our lives. Fluffy and Squeaky were stray cats that adopted us. They were both declawed and living outside. I can't imagine why anyone threw them away; they are the sweetest cats. I have been so fortunate to have them in my life. They really did find us and I am so grateful. Fluffy adopted us in 2008. 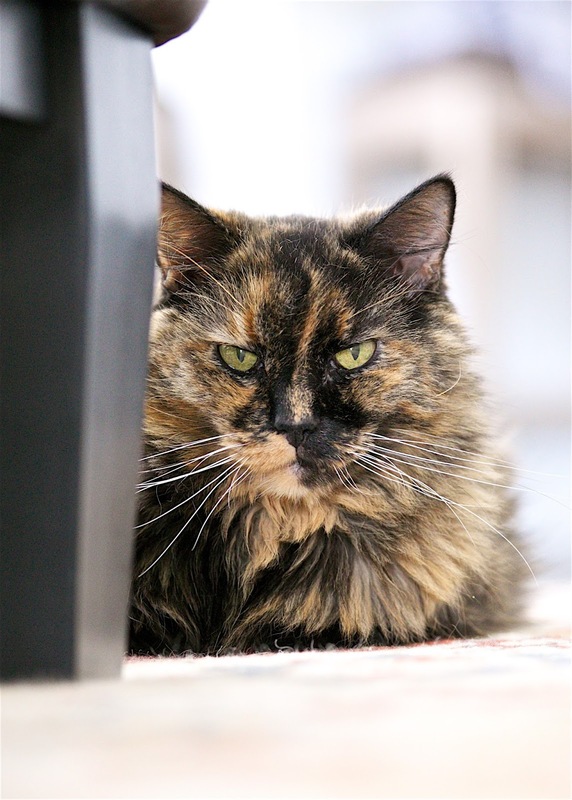 She had been coming around the house for months, and one day I realized she didn't have a home. I fed her and she was ours! My little fluffy is feisty but so sweet. She LOVES it when I scratch her head. She always lets me know when she wants me to pet her by tapping me with her paw. I also love that she sits with me in my office during the day and "helps" me write blog posts. True to her name, Fluffy acts as our third pillow almost every night. Squeaky adopted us two years ago on the 4th of July. She was in really bad shape, but we got her in tip-top shape and can't imagine life without her. I love how sweet she is. She LOVES to eat and sit on Chicken Legs' lap and get brushed. Honestly, Chicken Legs and Squeaky are two peas in a pod! Always together. 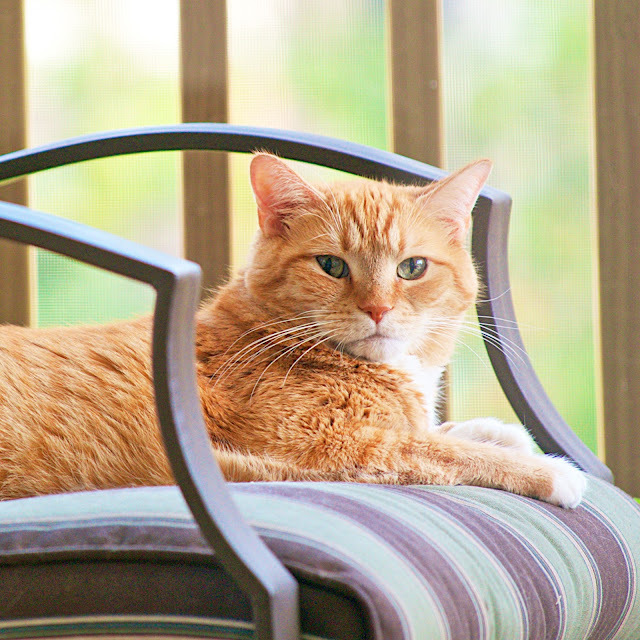 If Squeaky isn't outside on the covered porch relaxing, she is hanging with her man, Chicken Legs. We adopted Jack as a kitten. He came into the house and was instantly "the boss" even though he was the youngest. Jack is my best friend. We hang out together all day! We can finish each other's meows. He has to have his eye on me - unless he is napping. Jack is also my bed buddy. We sleep next to each other every single night. I can't sleep without him snuggled up next to me. Everything we do is for the cats. Heck, we even bought our new house because it fit the cats needs (as well as ours). I mean, they had to have a covered porch! I have a shirt that says, "I work hard so my cat can live a better life." It sounds crazy but it is SO true! We are very close with our cats. We are all #PurrfectTogether. Meow Mix believes the world needs more #PurrfectTogether people and cats!! I saw this new Meow Mix® Bistro Recipes™ cat food Rotisserie Chicken Flavor when I was at Target last weekend. I knew I had to get it for the cats. They go NUTS when I buy a rotisserie chicken, so I knew they would like this. I love the little chicken leg shapes!! 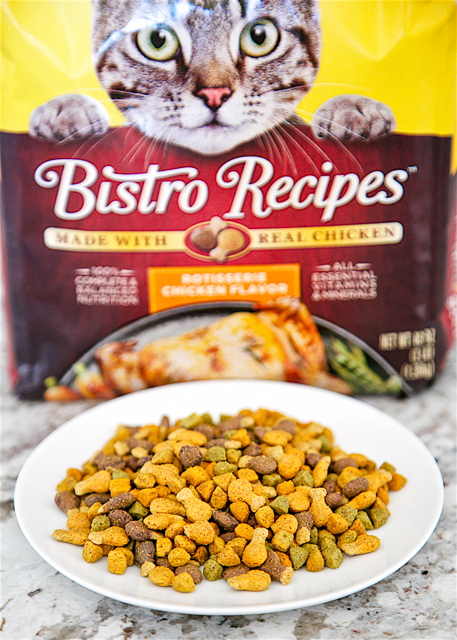 All the cats really enjoyed the Meow Mix® Bistro Recipes™ Rotisserie Chicken Flavor. They were purring and licking their chops after eating this yummy food!! 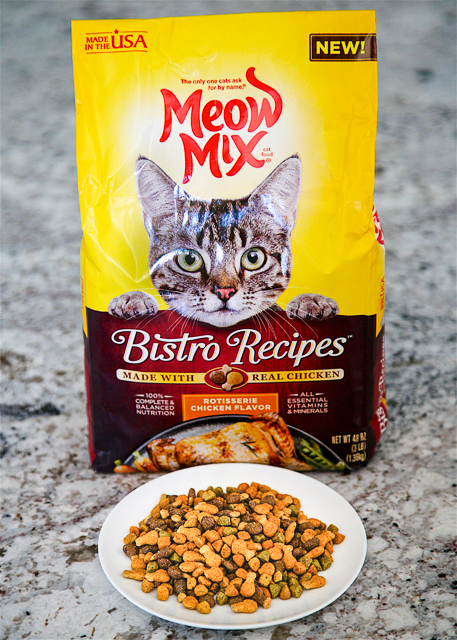 Meow Mix® Bistro Recipes™ is available at Walmart, Meijer, Kroger & Target. Connect with Meow Mix® on Facebook, YouTube, and Instagram. My cat and I are #PurrfectTogether. He is obsessed with me. Constantly comes over to me rather than the rest of our family. My cat and I are #PurrfectTogether! She always greets me as soon as I get home and sits with me all the time. Yes, we are purrrrrfect together!! My cat and I are #PurrfectTogether! She loves to cuddle and lets me know everyday how lucky I was to be adopted by her! Me and my cat are #PurrfectTogether, she is my partner in crime for cuddling on the couch for hours. My cat and I are #PurrfectTogether. He loves to cuddle when I watch tv. My cat and I are #PurrfectTogether! She loves to sit with me on the couch. Yes we are #PurrfectTogether! He loves cuddling with me, he's a lazy boy.